10 hours surf lessons, 7 days accommodation, food, Tuk-Tuk transfers to the surf, and surf equipment – from 490 € per week. Accommodation in your choice of room. 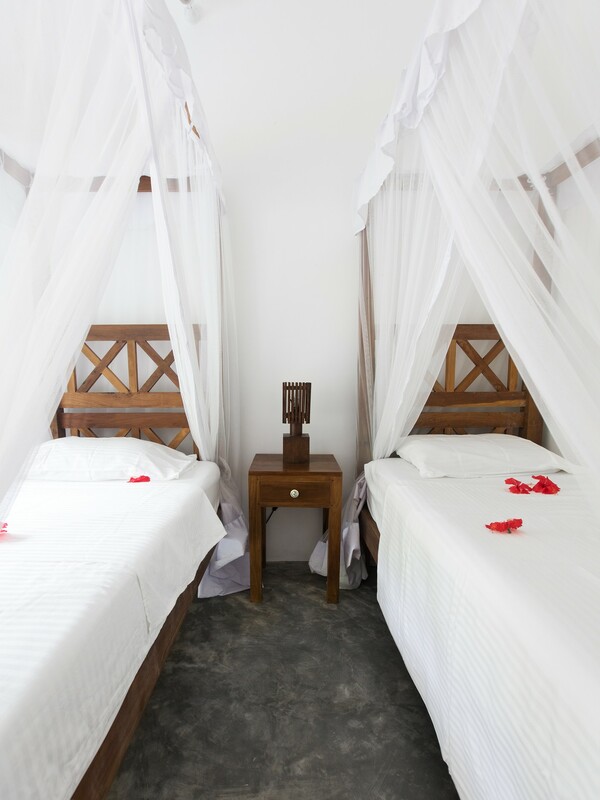 From shared dormitory-style rooms to private balcony suites, there’s an option to suit everyone. Three fresh and healthy meals each day to fuel your surfing progress. Fresh fruit, water, tea & coffee available throughout the day too. 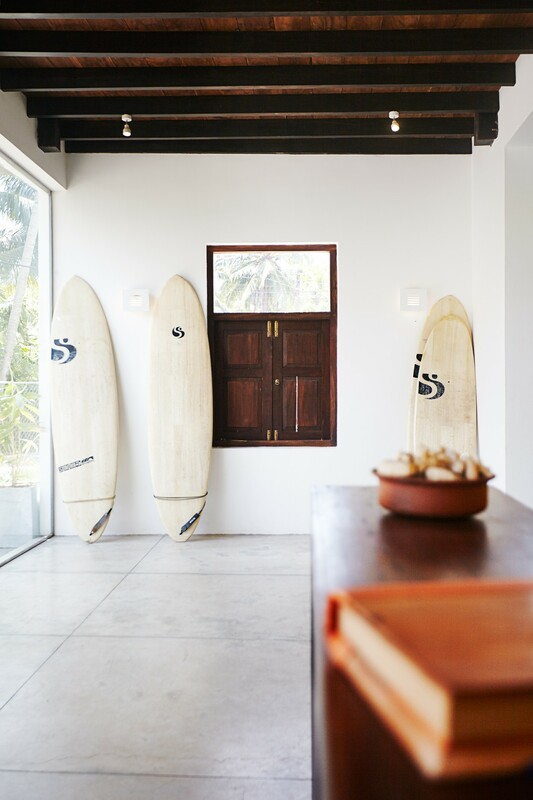 Yoga sessions, to complement your surfing. Improve your flexibility and relax your muscles. Yoga, fitness equipment, swimming pool, parties, and much, much more! Extensive range of surf boards, from foamies to various shapes of high performance Sunova surfboard. Multilingual and licensed surf instructors. Maximum of eight students per instructor to ensure both quick progress and your safety. Lesson programme includes surf theory units and video analysis. In close reach of surf spots for any ability level. Tuk-Tuk transfers to the surf up to three times a day. Open 1st May – 31st October. From 18 years old. Shuttle service available from Colombo airport. The surf camp in Sri Lanka is situated on the South West coast of the island. From the camp there are surf spots in easy reach to suit any level of surfer. From chilled beach breaks for the absolute beginner, to gentle reefs for those with a little more experience, to hollow barrelling waves for the advanced surfer. The Sri Lankan coast upon which the camp sits really has it all. The surf camp’s included Tuk-Tuk service will see you at an ideal surf break within a maximum of 20 minutes. What’s more, there are excellent waves to be found whichever month you choose to visit. October to May is traditionally known as the peak surf season in Sri Lanka. However, from June to September, the so-called offseason, there are still great waves to be had. Whilst you can find uncrowded breaks any time of the year, if you want to live out your dreams of surfing amazing breaks alone, June to September really is the time to visit. The camp’s surf lessons will progress your surfing to the next level, whether that means standing up on the board for the first time or landing your first aerial. The Indian Ocean provides a very pleasant environment to learn in too, with sea temperatures that average 29°C, and accompanying air temperatures of no less than 25°C. You can certainly leave your wetsuit at home! Practical surf lessons are accompanied by theory lessons and video analysis, for all surf levels, to aid your progress in the water. The camp accommodation is luxurious, with clean, spacious rooms set within expansive grounds. 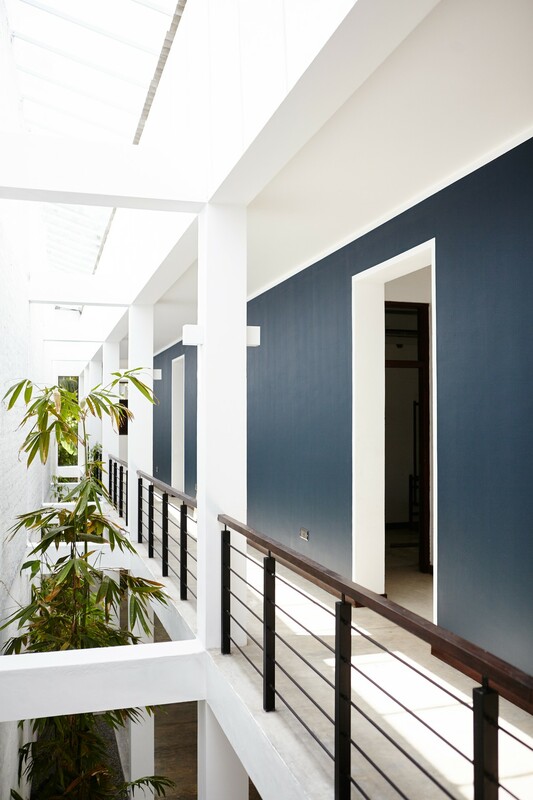 There are a variety of room options to choose from, from shared dormitory-style rooms, to private balcony suites. 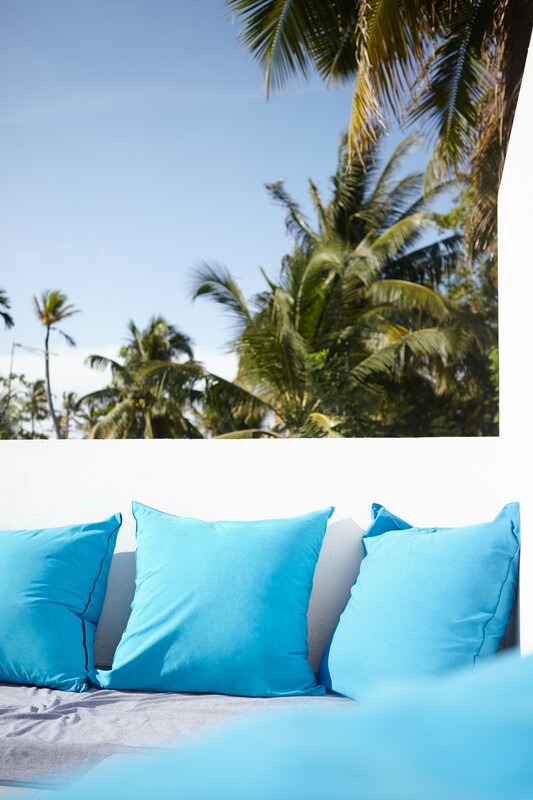 After a long day of surfing, relax in the pool or on one of the terraces. There are shops and restaurants only a short distance away, easily reachable by either foot or Tuk-Tuk. Aside from what its coastline has to offer, Sri Lanka boasts beautiful countryside, national parks with a plethora of wildlife and plenty of cultural places of interest to visit. Towns steeped in history, elephants roaming in the wild, and tea plantations high up in the mountains, Sri Lanka truly is a very vibrant country. 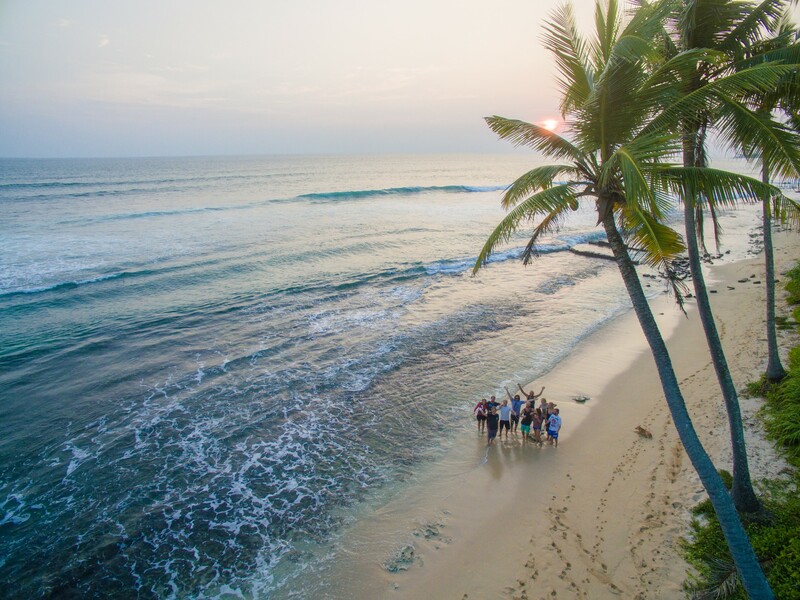 Experience the magic of Sri Lanka at the surf camp!